One of the sweltering days we were in Philly, we stopped by the quirky Little Baby’s Ice Cream in the West Philly neighborhood that is attached to this equally funky pizza shop called Pizza Brain. 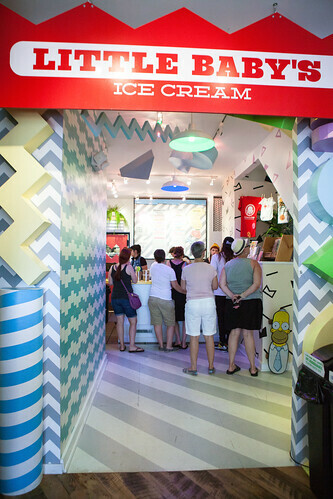 Reading through the ice cream flavor menu, it’s pretty mind bending as to how crazy their flavors are like Grape Grape-Nuts, Peanut Butter Tarragon, and their signature Earl Grey Sriracha. 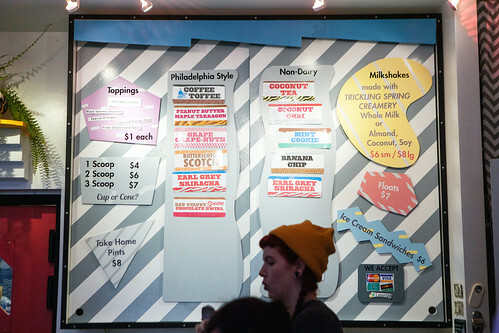 I did sample their offerings before devoting myself to my own serving and did think their Philadelphia-style ice creams are very rich that it could almost be a meal in itself, hence aptly billing themselves as “super premium ice cream.” The Earl grey sriracha was mostly floral from the tea infused in their locally sourced dairy at Trickling Springs Creamery and it does build up a floral, spicy kick in the back of your throat. Oddly tasty. 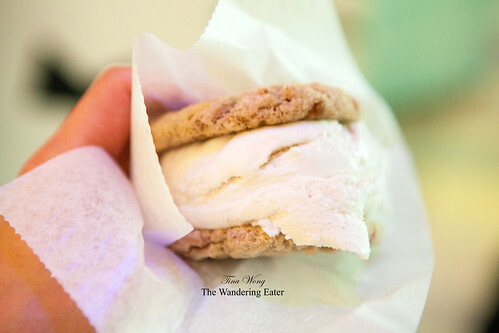 My traveling companion loves tropical flavored desserts so the non-dairy Coconut Chai ice cream sandwiched in chai snickerdoodle cookies ($6) made the most sense. The non-dairy aspect of these ice creams were that they are made with coconut milk instead of the standard cream and milk. This ice cream was still very creamy, not too sweet, and it’s packed with a ton of coconut flavor with a spiced chai tea undertone. The chewy, nicely spiced cookie was partially baked so it won’t be too brittle and fall apart by the time you’d bite into it and accompanied the ice cream well. I opted for a cone of Coffee Toffee ice cream topped with black sesame nori ($5). I liked that ice cream flavor when I tried their sample; not too sweet, decadently rich and the cold brewed coffee flavor with toffee was balanced. 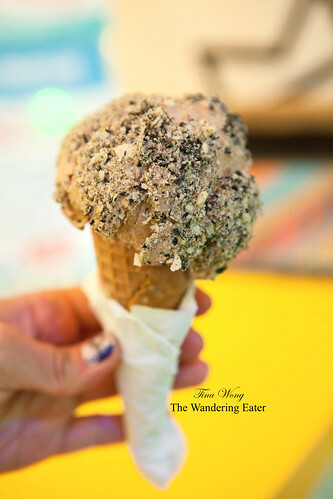 I wanted something weird to top to echo the spirit of this ice cream shop so the person assisting me said the black sesame nori (or seaweed) would go nicely – and it did. Nutty and the seaweed added an umami element that’s sort of savory but still emphasized the ice cream’s sweetness. I liked this a lot.